Kurt Speaks Out - Digital PDF Version - Download Now! 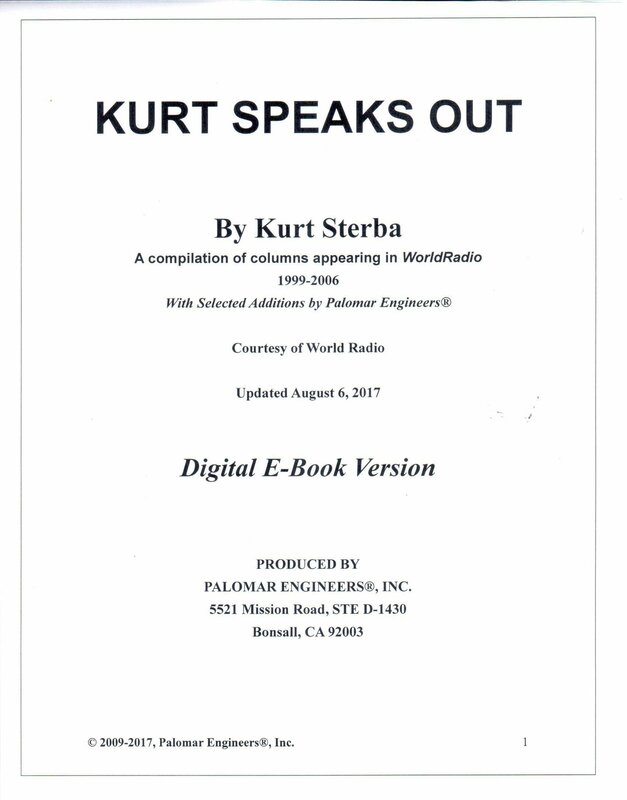 This book contains 50 of Kurt Sterba's Kolumns from World Radio (1990 to 2006). 140 pages packed with sage advice, unusual antennas, and ham radio myths to avoid. Read, learn, and enjoy. Included are unusual antennas: CCD, T2FD, OCF, Rattail Ver-Tee, G5RV, ZEPP, Loops and many others. Find out the real truth about antennas and STOP WASTING YOUR TIME and MONEY trying to get the lowest SWR! SPEND a measly $2 and get educated by one of the experts – Krusty ole Kurt!! Kurt N Sterba, sometimes known as “Krusty Olde Kurt” or “The Krusty One” and often as “The Masked Avenger”, is fearless in exposing antenna manufacturers who lie or use deceptive numbers to inflate the gain dB’s of their antennas. He also deflates those who use “new scientific breakthroughs” to explain the operation of their products. He pieces through the obfuscation of on-the-air antenna “experts” by explaining antennas, grounds, and feed lines in non-mathematical, simple English. His aim is to see that all understand the real basics of antennas, and are not taken in by the ever-prevalent, fine-sounding ad writers and other purveyors of false information. This version is published by Palomar Engineers, Inc.